The man convicted of carrying out the bombing of a Pan Am airliner in 1988, which killed 270 people, has been released from prison in Scotland. Abdelbaset Ali al-Megrahi - who has terminal cancer - was flown back to Libya. His wife had said she was looking forward to spending Ramadan with him for the first time in 11 years. A smartly-dressed family man, with a strong command of English, Abdelbaset Ali al-Megrahi does not outwardly fit the modern stereotype of an Arab bomber. But for 10 years, the Libyan was on the FBI's top 10 "most wanted" list. 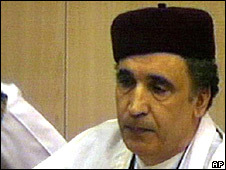 Megrahi was convicted in 2001 of murdering 270 people by blowing up Pan-Am flight 103 over Lockerbie 13 years earlier, but has always denied any part in the atrocity. He was born in the Libyan capital, Tripoli, on 1 April 1952 and his first language is Arabic. However, he studied in the US and also visited Britain "four or five times" during the 1970s when he is said to have spent nine months studying in Cardiff. The father-of-five, who married in the 1980s, later lived with wife Aisha in her father's modest house in the Tripoli suburbs. He described himself as the former director of Libya's Centre for Strategic Studies, a role which - the FBI claimed - gave him cover to act as an intelligence officer for the Libyan Intelligence Services (JSO). Despite Megrahi's denials, this was accepted by judges who tried him. But it was his appointment as chief of security for Libyan Arab Airlines (LAA) which, prosecutors successfully argued, allowed him to carry out the bombing. LAA had an office in Malta, where Libyans were able to move freely. From there, Megrahi was able to use as many as four false passports to travel to Zurich, where the timing device for the bomb was made, and Tripoli. 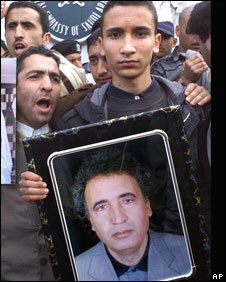 During the Lockerbie trial, Swiss businessman Edwin Bollier, who ran the Mebo company which supplied the timers, claimed Megrahi may have been related to the Libyan leader Colonel Muammar Gaddafi. There was no dispute the 56-year-old was a cousin of Said Rashid, a fellow senior JSO member and influential member of the government, who played a key role in Libya's anti-US terror policies during the 1980s. It was scraps of clothes wrapped around the bomb which detonated aboard the airliner that led investigators to a shop in Malta and, eventually, to Megrahi. However, it was only after eight years of living under armed guard - relying on a small LAA pension and work as a teacher - that he was handed over for trial. Two of Megrahi's children, son Khaled, and daughter Ghada, watched as he gave evidence at Camp Zeist in the Netherlands. In television interviews shown to the court, Megrahi appeared gentle. He told reporters: "I'm a quiet man. I never had any problem with anybody" and said he felt sorry for the people of Lockerbie. After nine months, three Scottish judges found him guilty and a subsequent appeal was rejected. He was sentenced to life in prison, with a minimum term of 27 years. He served the first part of his sentence in Glasgow's fearsome Barlinnie prison. Megrahi was segregated in a high-security area dubbed "Gaddafi's Cafe", where there was said to be a "sitting room" and kitchen where Halal food was specially prepared. Former South Africa president Nelson Mandela, who had helped broker the deal which allowed the trial to take place, visited him there and called for him to be moved to a Muslim country to avoid harassment from other prisoners. However, in 2005, he was transferred to nearby HMP Greenock, where there were no special provisions and he mixed with other "lifers". Megrahi was given a fresh chance to clear his name when the Scottish Criminal Cases Review Commission (SCCRC) referred his case back to appeal judges for a second time. His appeal got under way this year and he has the backing of ex-Labour MP Tam Dalyell and Dr Jim Swire, whose daughter Flora died in the bombing. The Libyan has five children, his wife moved the family to the outskirts of Glasgow so they could visit him. It was announced last year that Megrahi had been diagnosed with prostate cancer and the disease had spread to other parts of his body. An application was subsequently lodged for his release on compassionate grounds while a bid was also made to have him transferred to a Libyan jail. What is the impact of Lockerbie release?